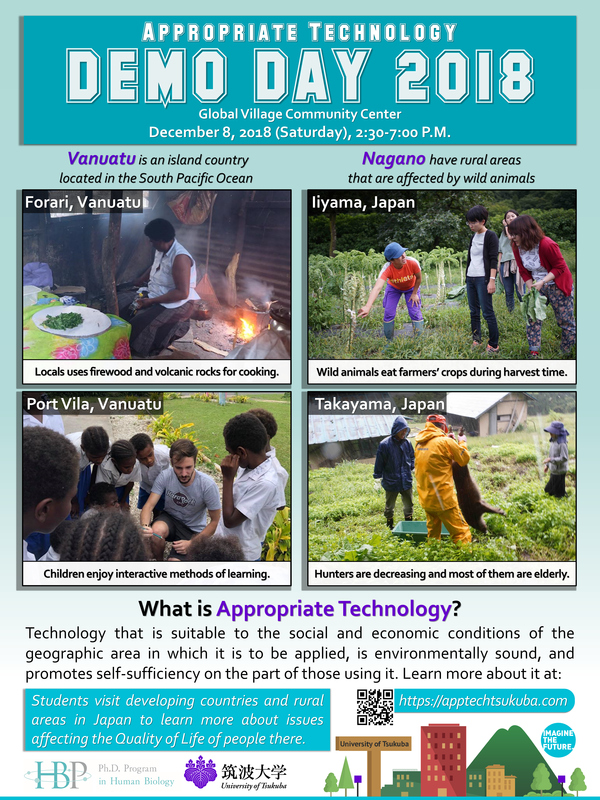 The Appropriate Technology Demo Day 2018 will be held at Global Village Community Center on December 8, 2018 from 14:30 to 19:00. Appropriate technology is a course conducted among students of Human Biology Program (HBP) and Frontier Medical Science as part of their curriculum.The Demo Day will be a venue to present their output prototypes to the public. Students will demonstrate how to use their technologies and present the sustainable business model based on their product. This year, students of HBP and Frontier Medical Science engaged in the field work in Vanuatu (a country in South Pacific Ocean), and Nagano in Japan. They faced various difficulties which these places have had and seek to solve. Throughout the Appropriate Technology course, students have developed their own ideas and built some prototypes from it. We wish many of you would be interested to see their outputs and participate in their talks and discussions.